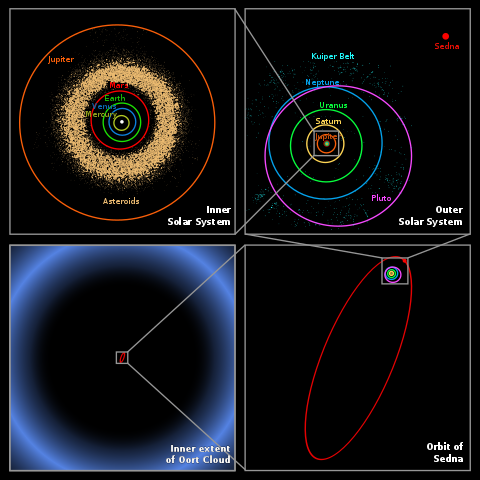 Scale image of the inner Oort Cloud in comparison to the solar system. Click to enlarge. Special Containment Procedures: Due to the limitations of publicly available spaceflight methods and the prohibition on colonization beyond the orbit of Uranus, civilian encounters with SCP-002-EX instances are considered unlikely. Standard disinformation and amnesticization protocols will be followed in the event astronomers discover instances. By order of O5 Command, the objects have been classified as Explained. Description: SCP-002-EX designates 23 large metallic structures in the outer Oort Cloud1, hypothesized to have been part of a megastructure of unknown size. Instances are composed of intersecting metal tubes, forming a lattice with large hexagonal gaps, and range in area from ~4km2 to ~20km2. The tubes are comprised of a carbon nanotube interior and an inconel2 exterior. However, such a megastructure would likely be broken due to gravitational effects, which carbon nanotubes are not strong enough to counter. The material needed to construct such a structure also greatly exceeds the amount of resources present in the solar system and the surrounding interstellar region. The function instances would serve is unclear as well. Even if the objects were only parts of a smaller megastructure, the inconel exterior is functionless in the low pressure and temperature of the Oort cloud, and the hexagonal gaps prevent SCP-002-EX from being used as walls or shields. Additionally, the structures do not match the designs of any spacefaring civilization known to have existed in the solar system prior to modern human civilization. This includes Species of Interest SoI-0024, Venusians, and progenitor █. ███████ groups (Inconclusive — refer to Addendum.3). No anomalous properties have been observed to date. An investigation into the objects' potentially anomalous origins was launched by the O5 Council, leading to the Explained classification decision. Further information requires Level 5 clearance. Addendum.1 — 13/Nov/2034: SCP-002-24-EX was discovered a kilometer underneath the surface of Sedna, artificially buried. Broken pieces of durable glass-like panels are present in the hexagonal gaps, found to have been heated to extreme temperatures and melted. Broken missile silos and laser weaponry are connected to the tubes. Several large rocket engines had been attached to the instance by means of a claw grasping mechanism, and had all exhausted their fuel supplies. While the rocket engine designs are unorthodox, no anomalous properties have been observed. Symbols of a spear piercing a hexagonal plate are engraved on each engine. Several days later, SCP-002-25-EX was spotted by an outer Oort cloud exploratory probe. Rocket engines of the same design were attached, each of which had experienced a mechanical failure that left the claws attached to the instance. One unattached engine was found nearby in the same orbit. The possibility that SCP-002-EX instances were relocated from their original positions into orbits in the Oort Cloud is under consideration. Addendum.2 — 28/Feb/2035: SCP-002-26-EX was discovered 5km beneath Sterkfontein in South Africa. Broken machinery is around the instance, and the presence of undetonated explosive devices suggests the machines were destroyed intentionally. The explosives are engraved with the same symbols as on the rocket engines found on SCP-002-24-EX and SCP-002-25-EX. The cadavers of two armored insectoid organisms, likely from a sapient species (now designated SoI-006), were found inside the remnants of two control rooms connected to the machines. Both had expired from gunshot wounds. Unlike other SCP-002-EX instances, the structure is not damaged, lacking parts of its outer coating and seeming to be in an unfinished state. Addendum.3 — 1/Sept/2037: A previously undiscovered chamber in a cave system in the Dordogne River valley, France, was found. A small cave painting is on one wall, depicting several objects resembling SCP-002-EX instances surrounding a shape potentially representing Earth. A human holds onto each instance. It is unclear if the humans are depicted bringing the instances together to cover Earth or are pulling them apart. By the painting is a steel spear driven into the severed head of a member of SoI-006. Armored human figures. The symbol of the spear piercing a hexagonal plate found on the rocket engines is carved onto the foreheads of each figure. Small spheres. Each sphere has a stylized skull symbol on it, and several have a spiral symbol engraved into them. Details on the spheres, excluding the symbols, have been noted to correspond with geologic features on exoplanets in a 100 light-year radius of the solar system. All of the exoplanets are Earth-like and are in the habitable zones of their stars.6 Investigation is forbidden by O5 order. Notably, a stylized rendition of an SoI-006 head was found in the cave painting's rendition of Earth, obscured by other dyes used. 1. A cloud of icy planetesimals surrounding the Sun at distances ranging from 0.8 to 3.2 light-years, located in interstellar space. 2. A superalloy used for handling high pressure and high heat environments. 3. The only other damage present is that from micrometeorite impacts. 4. An extrasolar species that attempted to colonize the solar system ~700 million years ago. Responsible for SCP-2651 and SCP-████. 5. Recreations of the device proved to emit lasers with sufficient heat to melt the glass-like materials found on SCP-002-24-EX. 6. The only spheres that do not correspond with an exoplanet are those with the spiral markings.